One of the top questions I get asked at trade shows is, "Do you have a MAM solution?" Well, yes. Of course. It's what we do; but thank you for asking. What you should be asking is, "What differentiates your MAM solution from the rest of the MAM pack?" Now we have something to talk about. For a lot of MAM solutions out there, workflows are designed - and defined - by writing scripts. There are various ways of trying to make that scriptwriting process easier, but basically you need someone who fully understands and is skilled enough at programming to write something genuinely useful for your business. That seems pretty standard, but is there a downside? There's a big downside, and it's one that we regularly see throughout the industry. Whenever anyone wants to make a change to their workflow, as they often do as working practices evolve, they have to go back to their MAM manufacturer, unless they have an in house programming resource available and get them to write a new script. It's time consuming, potentially costly, and invariably the MAM supplier is unable to respond in the timeframes in which the business is operating. So that's where your differentiator comes in? Yes. 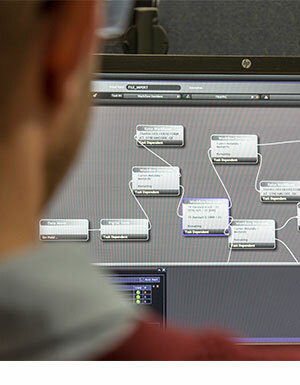 Within our Mediaflex® range of products we offer a graphical user interface that enables an authorised user to simply build workflows by dragging tasks blocks from an extensive task library and arranging them in the required sequence. Once designed workflows are saved as presets within the system and can be launched either manually or automatically as required, there are no restrictions on the number of workflow presets supported by the system. It must be a pretty comprehensive library. Our library has been built up as a result of providing service to major media clients over more than 15 years and includes more than 40 tasks that cover all of the major operations that typically take place within a media-centric workflow. That includes tasks like transcoding, auto QC, file movement, archive and store, and much more. That level of detail is important to the user. For example, there's a task to move tapes from A to B if you want to move a tape from your library to your ingest area; there's a task for ingest; a task for assessment; a task for editing, and much more. A whole sequence of tasks to address specific workflow requirements can be built because there's really nothing missing, which in turn means that you don't have to go back to a manufacturer to ask for new scripts to achieve what you want to do. Does that, in effect, diminish the need for in-house programming expertise, or the need to hire it in? Yes, and that's an important message. Anyone with half a day's training can build workflows by dragging the required tasks into the Mediaflex workflow designer. When you do that, you right click on the task and an edit screen pops up that which enables you set up the preferred parameters for that task. Let's use transcode as one task that most people understand well. If I put a transcode task in my workflow and open up the edit window, I select which transcoder I want to use and Mediaflex interrogates the transcoder to see what profiles are set up on that transcoder, and I select the one I want. It's that simple. If I want to go from IMX50 to DV25, I choose that profile pre-set and away I go. There's no need to worry about how to set up a profile, which is a huge time and money saver. Surely, as business models and associated workflow requirements evolve, there must be a need for some highly specialised tasks. Do you account for those? Yes. There are specialist tasks that enable the user to make their own decisions within the workflow. We call it "content intelligence", which lets us branch the workflow depending on the value of the selected metadata fields. The user can make those decisions based on any metadata field in the system. A typical example would be if a file format was HD, it could be branched one way, if it was SD, it could be branched another way depending on the desires of the user. It would be the same, for example, in QC. A "pass" goes one way, a "fail" triggers an alarm to an operator. Is that functionality different from other offerings on the market? Being objective, most manufactures would offer roughly similar functionality in those terms but, again, it boils down to the script. If a user wants to add decision criteria, as end users often do, someone has to edit the script. Whereas, with Mediaflex, we have abstracted the complexity of the programming language and presented a very simple and intuitive interface that enables the user to add decisions to the workflow very easily without concerning themselves with the script. This all sounds very "software-defined". Is that an apt description? Very much so, and it's a term I like. Another aspect of that software-defined workflow is something we have called "registered service task", which is a special service task that can be inserted anywhere into any workflow. Basically, it pauses the workflow to enable the client to run a special bit of programming if they want to. So, having said there's little need for additional scripting, there is always someone who has a clever idea. The registered service task can pause the workflow, export metadata values, and enable the user to run their own programme scripts or trigger manual processes. An agreed set of values are returned to the Mediaflex workflow, which are then picked up and carried forward through the process. What this means is that if someone has the skills and wants to write a highly specialised bit of scripting language to do something really clever around a bunch of metadata values, they have the option to do that. So, it's not TMD's way or the highway? Well, we happen to think ours is an express lane, but if you've authored activities that you want to insert into your workflow, it's your system. Be our guest. It'll still be the in fast lane. The registered service task also enables someone to customise their own API to integrate with a third party product. If a facility has a product that is not currently supported by Mediaflex, they can write their own API integration using Mediaflex's registered service task. In short, it's just a way of stopping the workflow, letting some other programme or process take over for a moment, and restart the workflow when the completion criteria have been reached. Scalability is paramount these days. Does Mediaflex track with that need? Mediaflex solutions are not only scalable, they can be scaled very affordably. We used to have one product that could be tailored with modules for ingest, archive, or whatever. What we have now done is productise those modules into a range of solutions. Each individual solution is effectively a subset of the bigger Mediaflex-UMS (Unified Media Service) product. We now offer those solutions as standalone, pre-configured products. We use the term ‘media services' because each service addresses specific workflow requirements for a work group or business team within the bigger organisation. We have media services for production, content preparation, archiving, ingest, and collections management. They all work as standalone solutions for a cost-effective approach to media management, or they can be combined to be part of an enterprise system if you wish. They all share the same core Mediaflex technology platform, the same database, etc., and all aspects will scale readily in terms of number of users, number of workflows being supported, and the overall horsepower of the system. As and when you want to do more, they all connect seamlessly to give you a comprehensive Mediaflex-UMS solution. Mediaflex-UMS can scale flexibly on premise, in a data centre or in the cloud. It can be configured with any number of TMD's media services, or a wide range of third-party services to deliver the precise media solution required. How easy is it to use a product like Mediaflex? Typically, we would expect to be able to train somebody within two or three days who has a specific role within an organisation. So whether they're an ingest operator or a producer or a supervisor or whatever, we have a range of user interfaces - the simplest of which is intuitive and requires no training. It enables the user to find content and raise work orders to do something with it. But then we have specific interfaces which are job specific. The UI's are user configurable and can be tailored to the preferences and respective skills sets of the user. From a user rights perspective we can easily switch off functionality so that specific users only see what's pertinent to them and their job. There are two levels, a UI that is technical to perform a job function, and another level that is intuitive for those who just want to find a piece of media and do something with it such as arrange for a DVD to be made, or a copy to be sent to a producer. These are all typical questions that we get asked at trade shows, and they're probably not much different to other MAM vendors. The differentiator is that we prefer to spend more time showing people what Mediaflex can do than just talking about it.